Canute or Cnut the Great was born circa 985 to 995 AD and was the son of King Sweyn Forkbeard. Canute’s reign and deeds were told of in Norse poetry, and was portrayed as a fierce Viking warrior; in the Knýtlinga Saga, Canute was “exceptionally tall and strong, and the recognised of men, all except for his nose, that was thin, high set and rather hooked. He had a fair complexion nonetheless, and a fine thick head of hair. His eyes were better than those of other men, both the more handsome and keener of their sight.” Canute’s successes as a ruler and conqueror gave the Danes an important link to the maritime region of Britain and Ireland. During his early reign, Canute was a harsh leader and resorted to executions and exile to maintain his precarious position as King of the North Sea Empire. 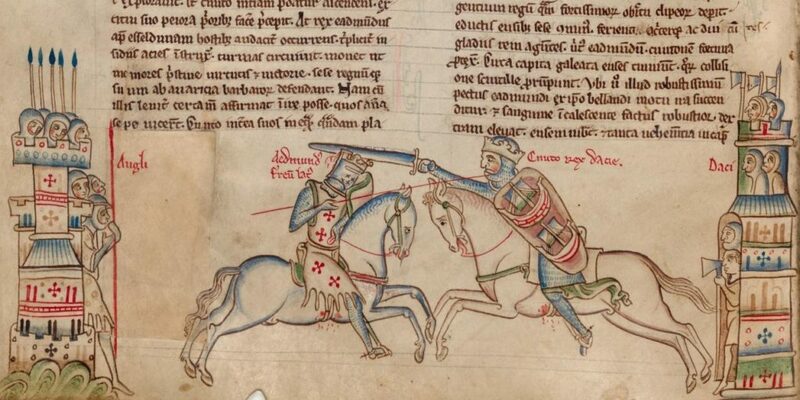 Canute engineered the murder of Edmund Ironside’s brother, chased Edmund’s children out of England and into safe Hungary and had many of his prominent English rivals killed. After a few years when his rule became more stable, he adopted a less harsh policy and allowed more Saxons into positions of power. Considered a conciliatory gesture, Canute repudiated his wife Elgiva and married Ethelred’s widow, Emma of Normandy. Canute became King of Denmark in 1019 and King of Norway in 1028 making him the ruler of a massive empire surrounding the North Sea. Canute converted to Christianity and was an avid protector of the Church; he promoted leaders of the English Church and was acknowledged by the Pope as the first Viking to becoming a Christian King. Embarking on a pilgrimage to Rome in 1027 Canute displayed reverence and humility and upon his return to England, he promised his Saxon subjects that he would rule with mercy and justice. Canute was remembered in medieval texts as a wise, successful and adept King, although this may have been due to his generous treatment of the Church who was the keepers of historical records at the time. He is portrayed as a religious and piteous man despite his sinful relationship with two wives and his harsh treatment of Christian opponents. Administratively Canute was adept and divided England into four distinct areas for administrative purposes; Wessex was the seat of government and directly ruled by himself, and East Anglia, Mercia and Northumbria had viceroys appointed to govern the states. 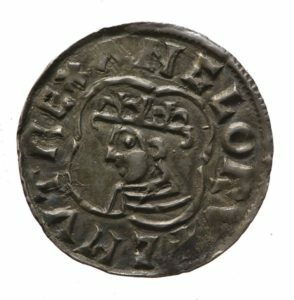 Edric Streona was named the Earl of Mercia but despite his new position he did feel he had been duly rewarded, and he argued with Canute. Edric proclaimed that without his desertion of Edmund Ironside Canute would not have been able to have won and claimed the throne. Canute replied that a man who betrayed one master was likely to do the same to another, and while arguing with the King, Edric was struck with a battle-axe by Eric of Northumbria and his head was placed on a spike on London Bridge. Medieval impression depicting Edmund Ironside (left) and Canute (right). There is a famous story proclaiming Canute’s vanity first recorded by Henry of Huntingdon in his twelfth-century Chronicle of the History of England, in which flattering courtiers convinced him he could hold back the tide of the ocean, the story is called Canute and the Waves. While history has remembered him as an almost humorous figure the medieval historian, Norman Cantor stated that Canute was “the most effective king in Anglo-Saxon history.” The size of his empire should be a stark reminder of his success as a conqueror and ruler. Canute insisted that his Kingdom should continue to be ruled laid down by Edgar the Peaceful (he, himself made some additions) and this led to growth in his overall popularity and strengthened his control. After raids in Scotland, Malcolm II, King of Scots, recognised the Canute was an overlord and peace with Scotland was established for the remained of Canute’s reign. Canute ruled England for nineteen years, and the protection he gave against Viking raiders (many of whom were under his command in the first place) helped to restore prosperity and the resources he commanded in England due to this influx helped him to establish secure control in Scandinavia as well. 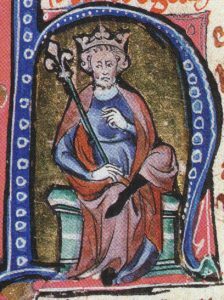 The Anglo-Saxon King died on November 12, 1035, at Shaftsbury in Dorset and was buried in Winchester Cathedral, Canute’s illegitimate son Harold I seized the throne of England.